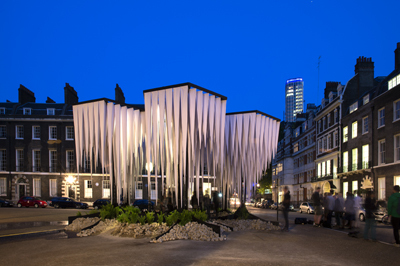 Rainforest by GUN Architects, located in Bedford Square in Bloomsbury outside the offices of the Architectural Association, has been one of the highlights of the London Festival of Architecture, now into its final week. The five metre high tree-like structures, created by the German-Chilean architectural practice, feature fabric stalactites which drip water into pools below. As well as installations like Rainforest, the festival features debates, exhibitions, film screenings, walks, cycle rides, open studios and family events which focus on the importance of architecture and design under this year’s central theme of ‘capital’. The festival runs until 30th June. For more details and a full programme of events still to run, see www.londonfestivalofarchitecture.org.